Zombie Mommies: Outpost: Save me from the zombies!!!! Summary: Deuce’s whole world has changed. Down below, she was considered an adult. Now, topside in a town called Salvation, she’s a brat in need of training in the eyes of the townsfolk. She doesn't fit in with the other girls: Deuce only knows how to fight. What this means is that what I thought about Aguirre's writing in Enclave is pretty much the same here...and I'm not yet sure if that's a good thing or not. On the one hand, I very much enjoyed the background and thought process that went into the world of Outpost. Deuce has found herself in Salvation (a town based on fundamentalist/religious doctrine) and must figure out her role in it. 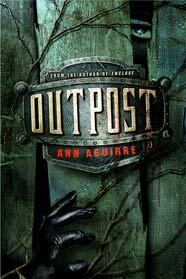 The world building in Outpost is one of Aguirre's strengths in this series. She really tries to have you imagine what the world might look like if it went apocalyptic: there was the gang and underground life of Gotham, evidenced in Enclave and now in Outpost, another scene of life in a separate and guarded town much further away. Could this happen in reality? I think so. So in that regard, what Deuce tries to make sense of is real: how she was raised in her former life and what she is being taught now. "Whether there was any truth to it or not, I accepted that flaw in human nature. Topside or down below, they always needed someone to blame..."
"...it broke my heart into a thousand pieces. But it wasn't time to be angry; I couldn't focus on how his behavior made me feel. I had to recall that self-doubt sliced at him like hidden knives." I'm not saying it isn't a good idea to go through this type of thought process because it is, but sometimes it felt like I was listening to a therapist talk--not a 16 year old girl. Granted I haven't lived Deuce's life but all this self-regulating-I-know-everything behavior just doesn't fit right. Because the focus of the story presents society in an emerging new world, I understand why Aguirre's writing is so plot-driven. I do think there could have been more "show-not-tell" scenes that might have picked up the pacing of the story. Outpost seemed to go on and on without much happening (at least to me) until close to the end. (Then my heart started pounding. Finally!) I guess for an apocalyptic world, I tend to expect more edge-of-my-seat reading. However, I do find the concept of the story fascinating and can make for some enlightening discussion material. And it's really because of that, that I give this 3.5/4 stars. I do think Aguirre has very nice descriptive writing. But what I am most happy about was the romance between Deuce and Fade! Sheesh, I'm such a sucker for romance. I do look forward to Horde (Book #3) but I might not be as fanatical about it as some other reads.